Oh, sure, Bread and Roses is a great idea, people were telling Mimi Farina when she began making the rounds four years ago with a dream of beginning an agency that would bring live entertainment into prisons, hospitals and other institutions. But after she'd gone, the more cynical of them must have privately thought that like most noble ideas, Bread and Roses would never become a reality. First of all, it would take an organization as competent as it is dedicated to produce 30 institutional shows a month, not to mention the money it would cost. And where are the rewards for the performers? How long would they be willing to play for free, knowing that a prison or a hospital show isn't going to result in a recording contract, or a little ink in the press, or even a gratis toke or toot between sets? So more than a few people were pleasantly surprised when Bread and Roses did become a reality, and musicians and other artists did respond, and shows began going on in places where the inhabitants had long since felt that they had been forgotten. As a journalist watching from the outside, it seemed to me that the emotional make-or-break point for the organization came in 1975, when Bread and Roses was preparing to bring a star-studded Christmas show into San Quentin Prison. Only days before the event, violence between warring inmate factions resulted in a tight lockdown and the cancellation of the show. It was a crushing disappointment, but, as it turned out, not a fatal one. 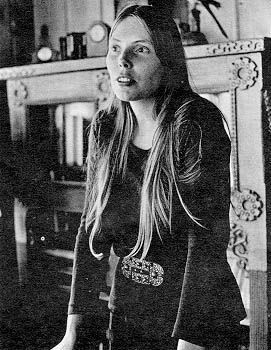 Almost all of the scheduled performers, including Boz Scaggs, Jon Hendricks, Joan Baez, Les Dudek, Verlin Sandles and Paul Krassner, showed up at Mimi Farina's house on New Year's Day to tape a program that was later broadcast over the prison radio network. Since then, Bread and Roses has brought entertainment to San Quentin six times as well as mounting productions at Soledad and other prisons and jails throughout the state. This year, under a grant from the California Arts Council, shows were presented at San Quentin, C.I.M. at Chino, California RehabilitationCenter at Corona and the California Institute for Women. Despite the elimination of state money brought about the passage of Proposition 13, plans are to escalate the prison project in the future. "Tehachapi is located in the Mojave Desert, 150 miles north of Los Angeles, about two miles from the end of the world. While the inmates of the institution are appreciative of the talent that does appear here, it is amateurish at best, and we have had a few shows that decency forbids commenting on. Isleedless to say, we are desperate!" The prison shows may be the most visible function of Bread and Roses' institutional work, but the 30 or so performances a month that are presented in convalescent hospitals, juvenile halls, psychiatric wards and day care centers, nutrition cites, and drug rehabilitation centers constitute the day-to-day hard work of the organization. Putting on these shows is often tiring, sometimes depressing, but never thankless, despite an original Bread and Roses policy that performers are not paid. At least not with money. As one musician put it: "Being paid for such a thing would be like offering to pay for a gift." "Away from the commercial setting, there's an ease in singing for the sake of singing," Mimi says. 'I'm concerned with social change and performers are people who have a power to create change." There are many stories associated with Bread and Roses, and one of them is that of Ellen Bennett, 76, a former professional singer, pianist and stage performer whose sparkling soprano lit up the Pantages Theater in Los Angeles on its opening night more than a few years ago. Ellen didn't do much playing and singing after a stroke left her without movement in her left hand, although she and her husband, also a singer and actor, did some music therapy with mentally retarded children in Marin County. At about the time of her husband's death a year ago, Ellen began performing for Bread and Roses in convalescent hospitals. As one of her friends put it, "Ellen knows zillions of songs," the old songs that hold meaning for the elderly. She still has the great voice, and so what if she has to play the piano now with only one hand. Ellen's shows are eagerly awaited, and we may enjoy doing them as much as her audiences enjoy hearing her sing. It's the kind of human give and take, the giving and getting back, that Bread and Roses is all about. One of the reasons that Bread and Roses has survived and flourished is that Mimi Farina has always surrounded herself with a bright and conscientious staff dedicated to the goals and principles of the organization. "We have a sense of group, of family," she says, "but everyone is also allowed independence, which results in new ideas and projects." Another reason is that there is a need for what Bread and Roses does so well. Proof of that can be found in the hundreds of letters of thanks and appreciation that pour in every year. Recently, Bread and Roses has added a new service— conducting a series of seminars aimed at teaching other non-profit organizations how to raise money through benefit concerts. A handbook is being compiled on how others might form organizations similar to Bread and Roses throughout the country. 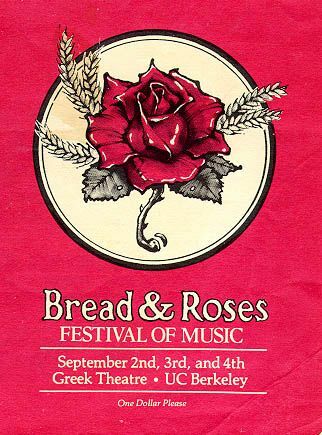 The proceeds from this festival will provide most of the funding for Bread and Roses for the next year. So by supporting this event, all of you in the audience are a part of Bread and Roses, too. Thanks. This article has been viewed 4,364 times since being added on January 9, 2000.